Vacuums great so far, I also enjoy the long cord. We have two dogs that shed, really happy with the purchase. Use this HEPA filter vacuum cleaner to effortlessly pull dirt, dust, allergens and other debris from your carpet. This lightweight vacuum cleaner by Prolux has soft vinyl wheels that make it easy to maneuver, which lets you clean large spaces without exerting too much energy. The vacuum's motor operates quietly, so you don't have to worry about disturbing your family as you clean. My first impression of this vacuum came while I was unpacking it. I liked the color, a Candy Apple Red Metallic. When I got it unpacked, which was not difficult, I looked at the fit and finish of the vacuum's pieces / parts and did not notice any flaws. The color was smooth and even and all of the parts, plastic and metal, were nicely finished with no sharp edges or flash / burrs from the plastic molding process. And everything fit together properly. The friction fit cleaning tools are well made and finished as well, and everything connects properly and securely. A well made, solid vacuum. I can see why it has such a good warranty, and it is an amazing deal for the price. Note: you will need a flat blade screwdriver to attach the handle, but a quarter will work if you don't have a screwdriver handy. After using it extensively for several days I still like it. It is probably the quietest vacuum that I've ever used. I don't feel like I need hearing protection to keep from hurting my ears, as compared to many of the vacuums I've owned / used. The stretch hose does have a tendency to cause the vacuum to tip, or to "follow" me, when I'm using it at close to its full extension, but this seems to be typical for upright vacuums of this style. It does seem to be less prone to tipping than the other uprights I've owned / used, though. But, with the (VERY convenient) extendable main wand, which securely locks in place where you want it, and the removable extension wand attached, you do have almost 12 feet of reach. So using the vacuum with the hose fully extended was not necessary for me. And with the 30 foot power cord I could vacuum a large area before having to switch to another outlet which is real convenient also. The vinyl wheels roll easily on all surfaces, and quietly on wood and other hard surfaces, and it is quite easy to maneuver. The carrying handle on top of the tank is comfortable to use and the vacuum is well balanced at that point, making it easy to carry when needed. And the attachments all fit neatly in the back of the vacuum, with the Mini Turbo Head stored securely and unobtrusively on the side, so everything is always right there handy when I need it. After giving my home a good top-to-bottom cleaning, I'm still using the 1st bag and the Full Bag indicator still has not come on, the HEPA filter still looks clean, and the vacuum still has good suction. And speaking of suction, the adjustable suction control is handy for reducing the suction when needed. It was a bit stiff to work at first, but it has smoothed out with use and works much easier now. The bags, HEPA Filter and post filter are all easy to get to for changing when needed, and the slide latches on the bottom plate make removing it a breeze when you need to change the belt or clear a clog. No screwdriver required, and NO lost screws either! Another plus is that when the beater bar brushes wear down, you can replace just the brushes, without having to replace the whole beater bar assembly. The bottom plate has channels for edge cleaning on both sides, and they seem to work quite well, whether on bare floors or carpet. And the Prolux 7000 really surprised me when I used it on my one bare floor, it didn't throw crumbs and other debris around, but sucked them right up, something I've never had an upright vacuum do before. The only Con I found is that when the handle is in the low position, actually laying flat on the floor, which I need it to do to vacuum under my bed, the nozzle/beater bar lifts up just enough that it does not contact the carpet. You have to hold the handle about 14 in.above the floor to have the nozzle/beater bar be in contact with the carpet, limiting this vacuum's ability to clean under furniture that is low and/or wide, like my bed. All in all, I would have given the Prolux 7000 a RESOUNDING 5 Star rating, except for that Con. But, because of the way I use my vacuum, I can only give it a 4 Star rating. This vacuum is impressive! After using it for several weeks I am very pleased with its functionality. It was easy to assemble and has a great look and color. The power of this upright is truly phenomenal on low and higher napped carpets and on hard surfaces. I like that I can adjust the suction power so that I can do my smaller throw rugs without them getting sucked up into the beater brushes and that also allows me to use the wand to clean my blinds and drapes. It is extremely easy to change to the wand and cleaning accessories when needed and they are stored right on the vacuum. I personally like the longer cord as that allows me to go from room to room and up the stairs without having to change plug-ins which saves me time and steps. I do love the lighted path the vacuum provides which I have never had before on any upright that I have owned. I haven't had to change the vacuum bag or any of the parts but I did ck that out prior to using it the first time and managed diassembly and reassembly in a very short time! The sealed hepa system is great in eliminating the dust that usually accompanies most vacuums. With the sturdy construction and long warranty I am confident that this product will serve me for a very long time. I am so impressed I am contemplating gifting my daughter with a Prolux 7000! Before we bought our Prolux we used a Filter Queen. Tired of hauling a canister around, and being subjected to very expensive replacement parts, I did my research for a good upright vacuum. Prolux fit the bill with many positive reviews and a great price. I wanted something with a powerful motor like the Filter Queen, and I am not disappointed one bit! It cleans and combs the carpet beautifully, even worn down carpet! Changing the bag is a snap to! For its size it handles well. Anyone with minor back pain and shoulder pain can maneuver the Prolux with ease and comfort. The attachments it comes with are wonderful, they really make cleaning easier, plus they are so easy to switch out. The hose stretches a good distance and it's not difficult to use or put back. I am enjoying it, even my children! They actually don't mind vacuuming now! Great for pets and serviceable! I was hesitate to make this purchase after burning out so many other vacuum motors over the years. I have to say, I'm so glad I bought it! My husband and my daughter suffer allergies from our pets, so I decided to try this hepa hospital grade vacuum. We have two dogs and two cats in our house, this vacuum saved my pets from finding new homes. It has the suction power of a turbo jet! My kids actually ask to vacuum the house (2600 Sq ft) because it's so easy to maneuver. It feels like it's self propelled. The attachments work really great on my staircase and furniture and the cord is super long. The led lights are really bright which isgreat formy hallway. The bags can hold a lot of stuff, and I mean a lot! I am able to vacuum up cat litter and dry cat/dog food without it slinging all over the floor! My family came to visit and commented on how sleek the vacuum looks. My sister tried it out and fell in love. It's definitely worth the money and you can't beat the warranty. My husband and daughter can breathe a lot easier and I am happy I have a strong sturdy well built machine! Love, love , love you prolux! Your a life saver!!!! Work horse of a vacuum with power to spare. We had a hard time finding a vacuum that would work on our thick pile carpet and returned 3 different units including Dyson and Shark before giving this a try. My wife was very skeptical, but after giving it a try she really loved it! It came with all the tools and instructions she needed and our rugs have never looked better. We have to dogs that shed like crazy but the PROLUX 7000 HEPA vacuum keeps the hair under control and my allergies are gone! 100% recommended and 5 STARS!! Great power the cleans my rugs very well. The light really helps in dark corners. Self adjusting for my hardwood floors. The rubber wheels prevent scratching of my hardwood floors. I have spent a lot more money in the past for vacuum cleaners that could not rival Prolux 7000. What a bargain, I've hit the jackpot on this one! It is not very often that write reviews on products but I find myself compelled to write one on the Prolux 7000 vacuum cleaner I purchased last week. 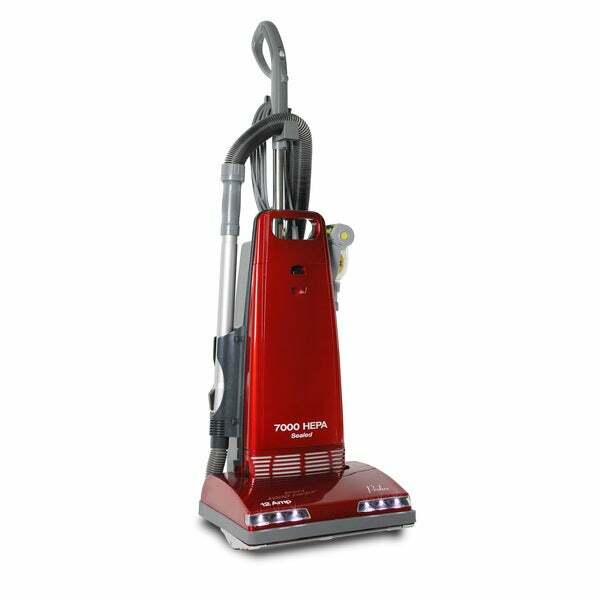 I consider myself a smart shopper; I read MANY reviews and compared options on various products and was lured to this vacuum in particular not only because of its outstanding 7 year warranty (most had only 2 or 3), but also the on-board tools, deep cleaning utility and the detachable wand was a big plus. Set-up took only five minutes. The instructions were as easy as a plug-n-play... just make sure the handle is pushed to the base until it stops, then retighten the screw and you're all done, ready to go. The fire engine red casing on this unit matches all my other household appliances and it has a gorgeous, expensive-looking finish. It's well built, sturdy, and the headlights are positioned perfectly. I learned something new with this vacuum that I never knew before because this is the first vacuum I've ever owned with headlights -- if you vacuum "in the dark", you can easily see every crumb and fuzz ball! As a result, my floors have NEVER been cleaner! I loved that I could detach the wand in 2 seconds to get into every nook and cranny. I loved that it is self-propelled which makes the duty a breeze. I love that it has a nice long cord that doesn't get tangled like some do, and that it stores easily into the closet. Overall, this is BY FAR the best vacuum I've ever owned! I'm very, very glad I decided on this model. There's only one problem I have: It makes vacuuming so much fun that my hubby and I now fight over who gets to vacuum and who does the dishes. So far, I've won every time! Ain't life grand!?! Thanks Great Vac! Job well done. No more dog hair! No more bagless mess! When my cheap plastic vacuum cleaner broke, I was so happy I had the chance to buy a vacuum that actually worked. Two things were needed: get rid of dog hair and have a bag. This vacuum is built solid. Strong fibers pull up dog hair and the powerful suction works with all the tools. I'm so happy with a bagged vacuum. No more dust in the air with each dump of the container. The house feels cleaner knowing dirt isn't being blown around. Add the sassy red color and you have the full package. I was so happy with it the first night, I posted it on my Facebook page! Fabulous vacuum cleaner at a very reasonable price! Has some great features that others don't have at twice the price. It is very solid and durable and easy to maneuver. This replace a much pricier unit that hardly compares to this one. Buy it. You will not be disappointed. problems right from the start. I really like this item, when it is working. However, we have found that it "clogs up" quite frequently and it is a devil of a time getting it unclogged. Also, it does not fit "under" furniture. It is too large. I love the fact this machine is easy to manuver, It works very well on picking up cat hair(I have 3) on different types of carpet,sculptures,low pile, area rugs. and linoleum. I love the long cord allowing me to move from room to room with little replugging. I looked at quite a few machines. This one has very smooth lines. easy to get to bag (I didn't want bag less). In the price range I was willing to pay. I love the brush attachment!! It is easy to assemble for use on my upholsted furniture and carpeted stairs. It too does an excellent job of removing cat hair. Did I mention it is a pretty candy apple red! i wanted a good vacuum for picking up pet hair and i definitely wanted one with a bag and HEPA filter. I read all of the reviews and was impressed. The vacuum has all of the features of high end vacuum's like Riccar, however is half the price. Reviews for this unit are excellent, giving me confidence that I will be satisfied with this product. "can you tell me the suction in either inches of water/ minute or cubic feet of air/minute? Thanks, Bruce Forsberg"
Hello baf39, thank you for your inquiry. Unfortunately, the information you have requested is currently unavailable. We will continue to try and answer this for you. You will receive an email notification once an answer is posted. Have a great day. "regarding suction; can you tell me either the cubic feet / minute or the suction in inches of water / minute? " "How often should the hepa filter be replaced, or can it be washed?" Hello Theresa, the filters are designed to be replaced when needed. Thank you for shopping with us! "how does it work with heavy pile carpet? I cant move a dyson on our carpet"
Hello rjmj, thank you for your inquiry. Unfortunately, the information you have requested is currently unavailable. We will continue to try and answer this for you. You will receive an email notification once an answer is posted. Have a great day. "Does the beater bar stop rotating when the attachments are being used?" Hello ken28, thank you for your inquiry! That is a great question! When the vacuum is snapped in the upright position (which is what most people will do when they use the tools) then yes the beater bar will stop spinning. When you release it from the upright position then it will start spinning again. I hope this helps. Happy shopping!